With a good pair of dial calipers you can measure the spring and fill in the information required below. 1.) 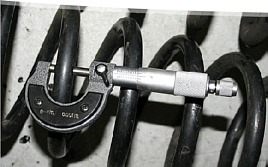 Measure from the backing plate of the front brake - to - the point where the strut bolts to the lower control arm. 1.) OR from the backing plate of the front brake - to - the center line of the coil spring where it sits on the lower control arm. 2.) Measure from the strut bolts to the lower control arm. 2.) OR from the center line of the coil spring where it sits on the lower control arm - to where the lower control arm bolts to the chassis. 1.) Measure from the backing plate of the rear brake - to - the point where the strut bolts to the lower control arm. 1.) OR from the backing plate of the rear brake - to - the center line of the coil spring where it sits on the lower control arm. 2.) Measure from where the strut bolts to the lower control arm. 2.) OR from the center line of the coil spring where it sits on the lower control arm - to - where the lower control arm bolts to the chassis. For new designs and changes to existing designs we suggest you call and speak with one of our design specialists. There are so many questions that need to be answered to supply you with a compression spring that works and is cost effective. Our design specialists are trained to help you answer these questions. For existing designs we ask that you fax or email a current print or send a sample. You may attach your coil spring drawing to this form by clicking the browse button below and selecting the file. Please make sure that your file attachment is zipped or that the total file size is under 1MB. Has there been a weight change in the vehicle? Please provide the appropriate data. Are you looking for additional height to the vehicle? Are you looking to lower the vehicle? Is the Ride/Rate being changed?